As anyone will know who reads my posts on Directors Notes, knows I’m a big supporter of my local film festival Filmstock and unashamedly try to promote it whenever I can. It’s with that in mind I’m posting to all our filmmaking readers out there, to let them know that Filmstock is now accepting submissions for the 11th edition of the festival. Filmstock is a festival that prides itself on supporting the Independent Film and like Directors Notes, does everything in its power to champion the best Independent Filmmaking that comes its way. 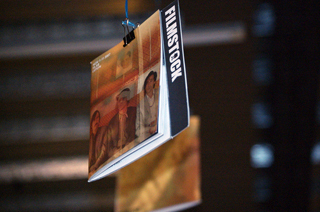 The Filmstock programme has a very special energy because each year it consists of films submitted by filmmakers. It is organic and diverse and every year is different. We show approximately 150 shorts, features and documentaries in our main independent strand. We have no agenda. We do not search for films at other festivals, or from film councils or distributors. We select from what you send. We are not influenced by trends or politics. We show what we like, and what we think our audience will like, and we have had no complaints so far. If you have a film you’d like to enter in Filmstock, check out the Submissions page. The Festival is running from 5th November to the 15th November this year and if you’ve never been to Filmstock, I’d highly recommend checking it out, as you’ll be hard pressed to find a more welcoming, friendly film festival.